Swapping rear end from 1987 Nissan into 1978 620? I recently got an 87 Nissan standard cab with hopes of scabbing suspension parts for my 620s, the rear end from the 87 is 40.5 in. Center of leaf to center of leaf. The 78 620 is 38.5 center to center on the leaf. The 87 total length is 3.5 inches wider. Both have 10 bolts on the pumpkin. I was wondering if this swap is possible without welding or cutting things, or if the internal differential parts are interchangeable. Looking grim to me, but thought I'd check. Thanks!!!!! Without welding or cutting things....Yeah, grim is the word. But the center carrier should work if the '87 is a 4-cylinder, as they should both be H190s. Just pull the axles out far enough to disengage the diff, and take the drive shaft off, followed by the 10 nuts holding the carrier in the housing. Remember, if it is a different ratio, you will have to change the speed drive gear in the trans to get the speedo to read correctly. And you may have to change the input flange. Not sure what year they went to a larger flange. I have a 2006 H190 in my 620, and had to change the flange. Why are you wanting to do this ? Is the 620 gears shot ? Simpler than you think on the H-190. Disconnect the driveshaft. Unbolt the backing plates on each side and slide the axles out 4-6". This will stretch the hydraulic brake lines slightly but will work . Drain the differential and remove the1 0 bolts holding the 3rd member in place. Pull the 3rd member forward to remove. You may need help pulling the axles alternately to disengage them from the 3rd member. BEWARE!!! the 3rd member is HEAVY and will suddenly drop out, so be ready for this. The gears remain together and undisturbed as a unit. Assembly is the reverse of removal. If changing the ratio you will need to change the speedometer pinion in the transmission to slow the speedometer. In my experience, you need to unbolt the hydraulic brake lines, but you can leave the emergency brake cables in the backing plates, but unclip the brake cables from the frame to get enough slack. I went through this a few months ago. All good now. I priced U joints for my 710 and they were around $40 each. This is a much safer bet for good quality. Try to find the ones with grease fittings. This will force you to at least have a look at them now and then when greasing them. Most owners, set and forget. 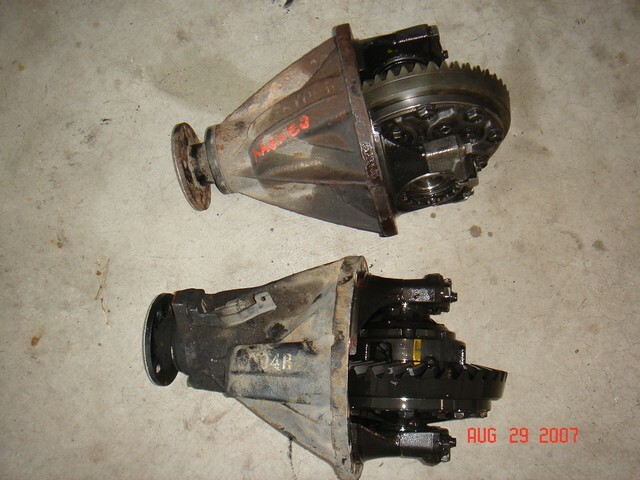 Replaced diff and still noisy? How do the axle bearings look?